Inspection: Monday, September 24, 2018, from 10:00 am to 2:00 pm. Payment Due: By 12:00 pm (Noon) on Monday, October 1, 2018. Don't neglect your chance to buy at your own price! Spotlighting a variety of recreational vehicles, ditch equipment, and so much more. This online auction features 175 lots including a Case Ditcher, boats, trailers, cars, ATVs, motorcycles, lawnmowers, generators, engines, and more. Lot #0105 Car Trailer - 16'x76"
Lot #0127 ATV Ramp 65"x15"
Lot #0138A Heavy Duty Ramps 45"x13"
Lot #0141 Lawn Mower 22"
Note: Certificate of Title, DMV Transfer form will be mailed 4-6 weeks following close of auction. Buyer is fully responsible for all aspects of registration and fees due to DMV. Note: Description and photos were provided by the Seller. 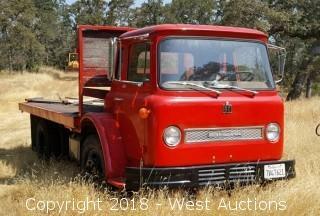 West Auctions has not verified any of the above information. NOTE: Item subject to Sellers confirmation. Rear trencher attachment - 6'x3"
Note: This item is not actively registered with California DMV. Buyer will receive Bill of Sale and Application for PTI, and will be mailed 4-6 weeks following close of auction. Buyer is fully responsible for all aspects of registration process if desired to obtain title/registration, and is responsible for all fees due to DMV. Note: Bill of sale will be mailed 4-6 weeks following close of auction. This vehicle does not run, has no engine/transmission or steering wheel, Seller will not be performing SMOG, "as-is" bill of sale signed by buyer/seller must be signed. Buyer is fully responsible for all aspects of smog, registration and fees due to DMV. 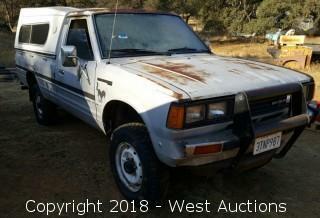 Note: This item is custom built and trailer is not registered with California DMV. Bill of Sale only. Note: Certificate of Title, transfer form will be mailed 4-6 weeks following close of auction. Buyer is fully responsible for all aspects of registration and is responsible for all fees due to DMV. Note: Certificate of Title, transfer form will be mailed 4-6 weeks following close of auction. Buyer is fully responsible for all aspects of registration and fees due DMV. Note: Certificate of Title and transfer form will be mailed 4-6 weeks following close of auction. This vehicle is registered as planned non-operational, Seller will not be performing SMOG, "as-is" bill of sale signed by buyer/seller must be signed. Buyer is fully responsible for all aspects of smog, registration and fees due to DMV. Note: Certificate of Title, DMV Transfer form will be mailed 4-6 weeks following close of auction. This vehicle is registered as planned non-operational, Seller will not be performing SMOG, "as-is" bill of sale signed by buyer/seller must be signed. Buyer is fully responsible for all aspects of smog, registration and fees due to DMV. Note: Application for Duplicate Title, DMV Transfer form will be mailed 4-6 weeks following close of auction. Buyer is fully responsible for all aspects of registration and fees due to DMV.